I dedicated this month to 2 things primarily: Fixing all the bugs that started popping up in the Game Maker Studio version of AM2R, and to give the soundtrack an update. Since I'm not using the Caster extension anymore, I now use the built-in audio functions for music playback. This means I have to change the overall volume of every track. This is a good opportunity to actually do a proper mastering work, after tweaking some instruments on some songs. Now, the soundtrack is not finished, the current tracks will be eventually improved, and more tracks are going to be added as they are finished. That's why I'm including a version number with it. This one corresponds to the upcoming demo update, that will feature all the speed optimizations I'm working on right now. AM2R IS LOOKING FOR A TALENTED PHOTOSHOP ARTIST!!!! 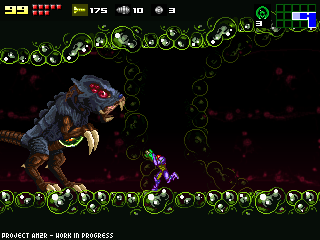 Then this is your chance to expand your portfolio with some awesome Metroid art. For now, I'm looking for someone that can provide a cover for the Soundtrack Album. Once the cover is done, I'll be reuploading the soundtrack including it. If everything goes well, the artist might be drawing artwork for the intro and ending cutscenes of the game too. If you're interested, please visit THIS forum thread and post some of your work. Links to Deviant Art are ok. Having Metroid artwork on your portfolio is not necessary. If you wish to show mockups or sketches for a potential AM2R Soundtrack cover, go ahead. Just keep in mind that your work might not be chosen. I'll be making the selection in about a month from now, so please, spread the word. The Game Maker Studio version of the game started showing plenty of small bugs. Some are tiny details that require small tweaks, others are consequences of the poor coding skills I had 5 years ago, and need some more work. Performance wise, it's a lot better than the currently released demo. And to make things even better, Nommiin/Decayed was kind enough to provide a license of the YoYo Compiler. Actually compiling the project boosts the performance a lot. It's about twice as fast. This means the upcoming demo update will run faster, smoother and (hopefully) without the speed issues some users experience today. You'll be able to play in older computers, and to actually record your playthroughs without much slowdown. All of my time is being dedicated to have this update ready as soon as possible. Once it's released, AM2R will officially have lived through 4 different versions of Game Maker (the project started on Game Maker 6). Will there still be mods in the final release? It's not that big of a deal, but just a cool little feature. Anyways, the project is coming along great, played the demo for the first time about 2 months ago and was blown away! So excited to be able to explore another metroid world! I think it's good to reach out for assistance. Sometimes, it's difficult to do a project of this magnitude on one's own. I'll let my music friends know a musical ear may be needed to assist with things on this. Awesome work. Are you going to have different ending artwork for different completion times? or maybe different difficulties. Like fusion, ZM and Super did? Now you just need to fix Samus' running animation and you'll be good to go. The current one looks very awkward. To make it sound on par with the rest of the soundtracks out there. I used a very gentle method of hard-limiting, and at most, the overall loudness is -10.5dB RMS, pretty soft for nowadays standards. Keep in mind these mixes are very clean, I'm not using dirty tricks, like sidechain abuse. @zoonyboy - No mod support is planned for the release, it might be considered for later. this game just keeps getting better and better. YOU ARE AWESOME DOC. The new versions of the music sound awesome and i cant wait for the next update. I love what you've been doing with the AM2R. I've been following this for about two years. As a fan of the original Metroid 2, it's nice to see it finally get the remake it deserves considering how overlooked it is in the series. I'm excited to see the final version upon completion. Even though the anticipation is killing me, I think I can continue to be patient since everything about it thus far has far exceeded my expectations. I do have to ask one thing though... Are you looking for anyone to contribute more to the soundtrack? I know you're asking about artwork currently, however, if you're looking for additional music I'd be interested in adding to it. I do a lot of ambient and atmospheric music as a side project and I've always thought to myself that some of it would fit in perfectly on a Metroid game. If you're interested, here's a link to some of that music. I have more that's not on there but I don't want to hit you with everything at once. The one specific track that I think would best suit the game would be "Digital Delusion". If you like what you hear then leave me a comment so we can discuss it further. Thanks in advance for not only doing what you're doing but for taking the time to read my comment and listen to my music if you do. Keep up the most excellent work! I know it's a hell of a long shot but I'd love to see this game released as a SNES rom, even at the detriment of some of its features; a la 'Rom City Rampage'. It'd be amazing to play this beast of a game on some real Nintendo hardware. Fanboy Fantasy rant over. for many Years now and im sure DOC you can do this things.Im so happy you have not givin this thing up. En el primer demo que se hizo en este proyecto, que luego quedó como el primer demo de Metrod Confrontación, el sonido para tomar un misil usted lo había hecho como el clásico metroid 2, pero no sé que le ocurrió luego, que colocó el típico sonido de metroid fusion y mission zero. I think when this game is 100% perfect, doc should try to approach Nintendo about asking a deal where Nintendo can buy the rights to this game and can sell it on the eshop on either the 3ds or the wii u. I think many people would pay 10 bucks for this game, and Nintendo doesn't have to do any work to update a fan favorite game. (After we all have our copies on pc to play of course). This just gets cooler and cooler! My PC is pretty crappy so it's great to hear that there are optimizations coming our way. Man, this project has been in the works for quite a while. I'm glad the good doctor is still working on it! dude tbh i still say you need to change the name. Another Metroid 2 Remake sounds so lame and stupid tho honestly after thinking long and hard about a replacement name i cant think of anything else other than maybe Metroid 2 Revisited which still sounds lame. Personal opinion on new cover art: do like a remake of the original cover design with Samus crouching and holding her smoking arm cannon up in the air with the alien rocky terrain behind her.